The official graduation rate for Brookings-Harbor High School Class of 2018, released by the Oregon Department of Education Thursday, Jan. 24, 2019, was 74.44 percent, compared to the statewide rate of 78.68 percent. 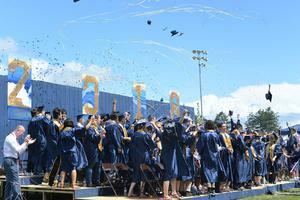 BROOKINGS — The official graduation rate for Brookings-Harbor High School Class of 2018, released by the Oregon Department of Education Thursday, Jan. 24, 2019, was 74.44 percent, compared to the statewide rate of 78.68 percent. 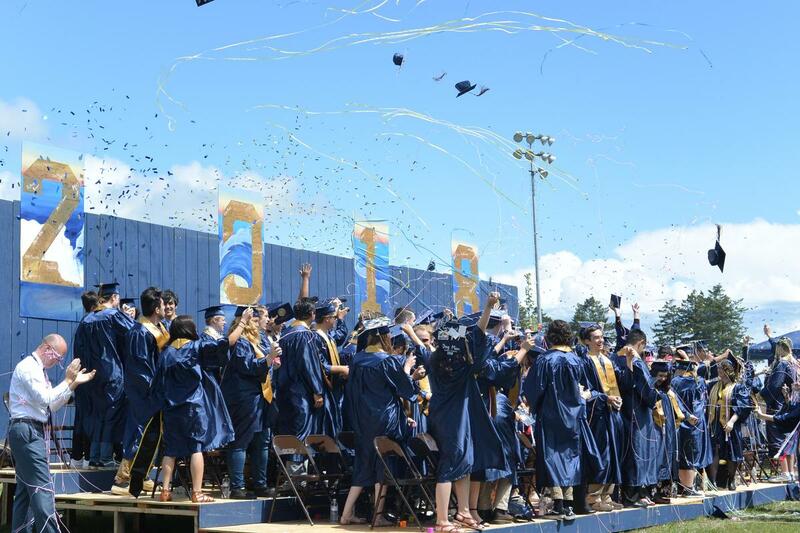 The Brookings-Harbor graduation rate saw a slight decrease from the Class of 2017 to the Class of 2018 in the official state numbers, from 76.98% to 74.44%, for students successfully graduating within four years. The four-year cohort graduation rate is the percentage of students in a cohort, adjusted for transfers into and out of the school, district, that earn a regular or modified diploma within four years of entering high school. Although the school’s internal data indicated that the district was likely to see a rise in this year’s rate as reported in recent presentations, the final graduation data released by the state is adjusted for students moving in or out of the district that is difficult to track at the school level. High student mobility rates in our region contributed to the surprise factor in the data. Also reported in the Jan. 24 data release from Oregon Department of Education, Brookings-Harbor’s five-year cohort “completer” rate increased to 78.40 percent in 2017-18, up 5 percent from the previous year, while the statewide rate was 80.04 percent. Completers are students who earned a regular or modified diploma (as well as those who earned an extended diploma, adult high school diploma, or GED) within five years. According to Lisa Dion, BHHS High School Principal, the school district has made strides in the past four and a half years toward establishing a graduation culture that starts in elementary school keeps students on-track along the way in middle school and focuses on immediate interventions for at-risk students in high school. The 2017-18 freshman-on-track rate released on the state report cards last fall was 93 percent (compared to a state freshman-on-track rate of 85 percent) and is a good indicator of possible graduation rate improvements in the coming years. In 2013-14, the freshman-on-track rate was just 59.3 percent. The Extended School Day program offers free tutoring, snacks, and transportation three days per week to any student at BHHS. Other examples of programs that students might be referred to or chose to participate in, include the Extended School Year summer program, dual credit course options to earn college credit while in high school through partnerships with regional college such as Oregon Institute of Technology, Southern Oregon University and Southwestern Oregon Community College, and career technical education classes and training certificate options. Brookings-Harbor High School has also brought a renewed focus on the importance of regular attendance and recently implemented a truancy court with the City of Brookings to boost accountability around attending school. Across the state, students who participate in Career Technical Education (CTE) classes have a higher graduation success rate than their peers, underscoring the importance and impact of the Brookings-Harbor School District’s current investments in growing and improving its CTE program and career pathway opportunities. This includes joint investments in vocational training classes such as welding and construction trades with Southwestern Oregon Community College. Mirroring this statewide trend, the 2017-18 four-year graduation rate for BHHS students who earned one or more credits in technical skill-based courses as part of the CTE program was 96.97 percent. Oregon Department of Education graduation cohort data available.